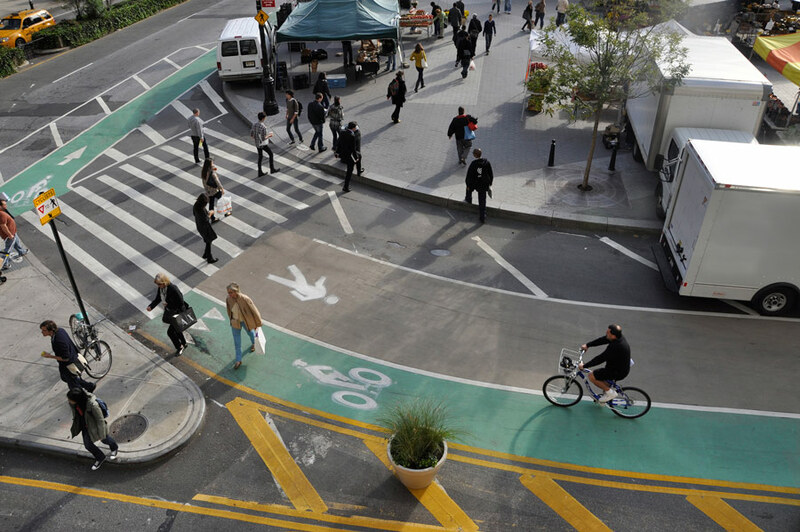 With few exceptions, biking in urban centers is a harrowing experience even for seasoned riders supported by healthy cycling infrastructure. To help citizens casually analyze the chaos, two German visual designers created a new kinesthetic map of bike shares that imposes harmony on street-level discord via evocative maps that illustrate how the shares shape urban infrastructure. The designers, Till Nagel and Christopher Pietsch, compiled GPS data from bike shares in three major cities to create cf. 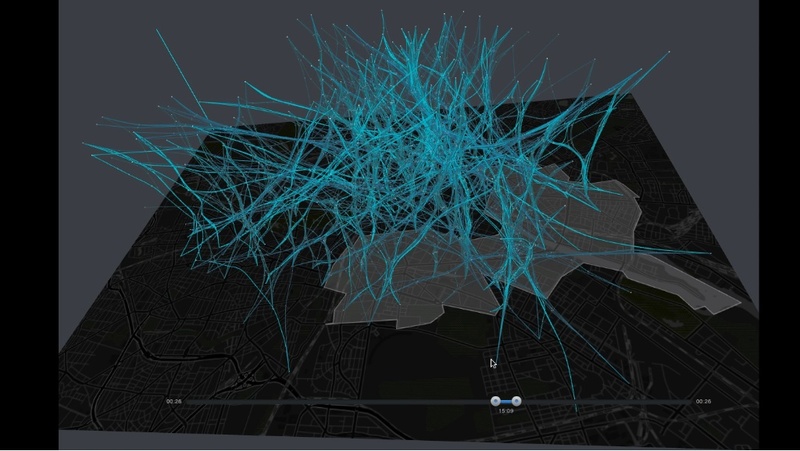 city flows, an interactive visualization of cycling mobility. Visitors to Potsdam's Urban Complexity Lab can compare mobility in London, Berlin, and New York on side-by-side screens. In New York, for example, colorful dots flagellate along Manhattan's grid smoothly until they reach a barrier between Midtown and Central Park South that shoots them back downtown. Viewers can zoom out to see evocative macro movements; zero in on select individual stations to observe color-coded incoming (green) and outgoing (orange) journeys; or access a "small multiple" view that juxtaposes data from different city districts. The designers visualize the trips by sizing base maps comparatively, extracting ridership data, and calculating optimal bike routes (more information on the project's methodology can be found here). In Berlin and London, the city's organic layout is more apparent as the designers tease out commuting patterns to and from business districts and most-visited neighborhoods. Compared to the 35,000 trips represented on the London and New York maps, Nagel and Pietsch explain that Berlin's less-than-2,000-trip map looks relatively sedate because most residents own their own bikes, while bike shares are geared towards tourists and leisure activities. 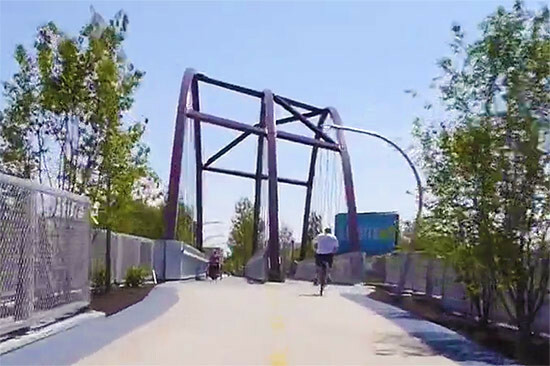 The East Coast Greenway Alliance (ECGA) has already completed almost a third of the 3,000-mile-long path, which would ultimately connect 15 states. The ECGA uses its resources to fund and organize local groups and volunteers to build sections of the path. 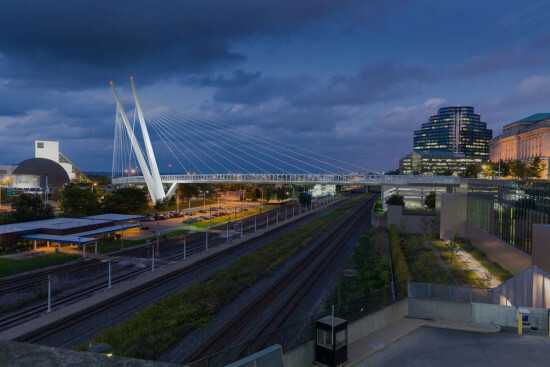 The Durham, North Carolina-based organization has highlighted that this approach fosters a feeling of community ownership of the path while taking advantage of local knowledge in planning and executing its construction. 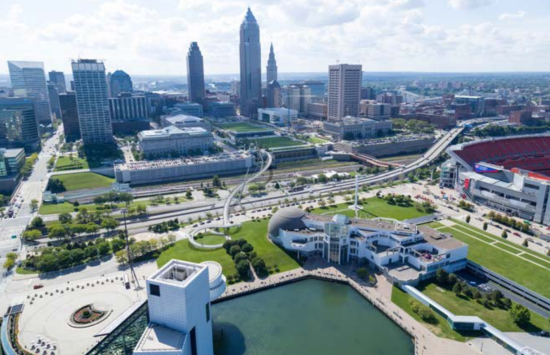 The growth of the path can be piecemeal, but 834 miles are already in place, and the ECGA hopes to add another 200 miles in the next 4 years. 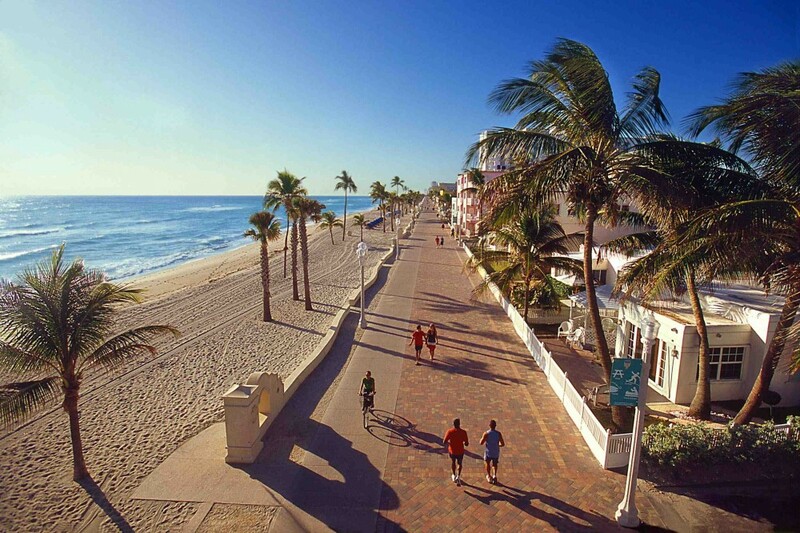 When complete, the path will run from Calais, Maine to Key West, Florida, and could be used by locals or serious cross-country travelers alike. More details on the ECGA can be found here. In urban canyons where tall buildings on both sides occlude sunlight, pollution, too, is prevented from dispersing. The Clean Ride Mapper is an interactive map that allows cyclists to choose quieter cycling routes with reduced traffic and pollution levels. After inputting starting point and destination, users are shown three color-coded routes—green being the cleanest (as measured by cumulative exposure to nitrogen dioxide and ultrafine particles from fuel combustion), blue the most direct, and red the quietest as gauged by average traffic density the cyclist is likely to encounter. 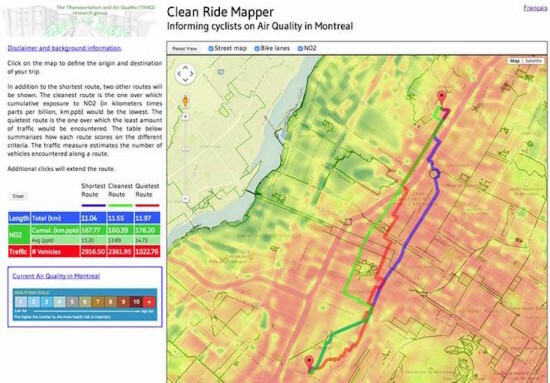 The map is powered by a dataset of air quality indices acquired over four years using $60,000 air-quality sensors attached to bicycles ridden by Montreal residents. While the routes occasionally overlap, there are times where cyclists must choose between an expedient journey or a roundabout ride for the sake of reducing pollutant deposits in the lungs. Maria Hatzopoulou, the creator of Clean Map Rider, claims that these detours are rarely longer than one kilometer (0.6 miles). Assistant professor of civil engineering at McGill University, Hatzopoulou created the online tool for cyclists in Toronto and Montreal as a project for the Transportation and Air Quality Research Group. “On certain days, some of Montreal’s most popular cycling paths, such as the one along the Lachine Canal, are also the most polluted because of wind patterns and proximity to highways,” a news release from the university stated. Considering its on-the-go user base, an obvious shortcoming of the fledgling tool is that there is no smartphone app, and users must click around—with repeated zooming in and out—to approximate their origin and destination rather than inputting an exact address. However, the map’s finer points are in the social pressure it exerts on cyclists to contemplate the smog they inhale every day. Clean Ride Mapper’s news release further cautions that traffic intersections fraught with idling cars also tend to be epicenters of pollution in cities. A similar project led by Columbia University in partnership with New York’s local NPR station, is being executed in New York City, whereby dozens of cyclists will be recruited to don air-quality sensors to accumulate data on bikers’ exposure to air pollution. 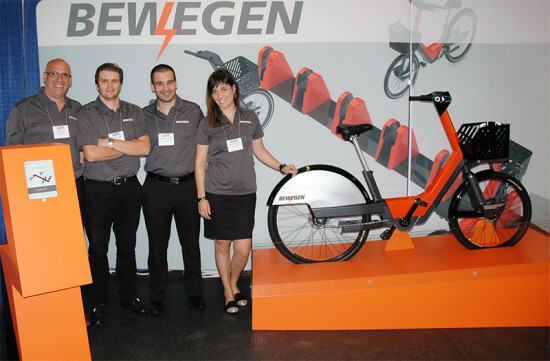 Conventional bike-sharing was a good start, but has many limitations. The modal share numbers speak for themselves. 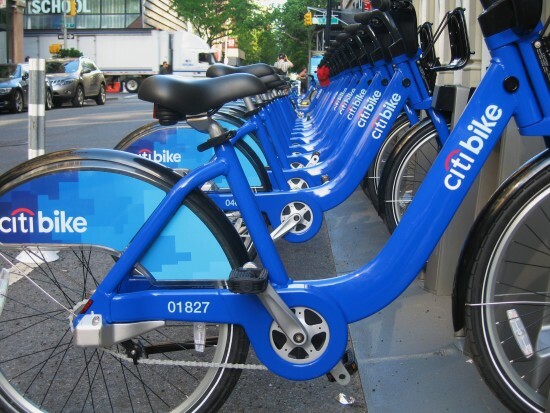 They limit the impact that bike-sharing can have on the urban transportation mix of a city. This also limits the pool of riders and the types of use they can get out every trip. I believe that shared pedelec (electric-assist) vehicles are truly the missing link in urban mobility and will soon become the norm. The system's pricing structure is still being worked out, but it will include annual memberships and credit card options for short term rentals. The city is crowdsourcing the kiosk locations and plans to launch a website and smartphone app later this summer. Decals will be placed at proposed kiosk locations and citizens can text their thoughts about each one to system organizers. While this system is novel for its use of electric-powered bikes, bike share is not new in the south. Cities like Atlanta, Nashville, Louisville, and Chattanooga have launched, or are planning, systems of their own. 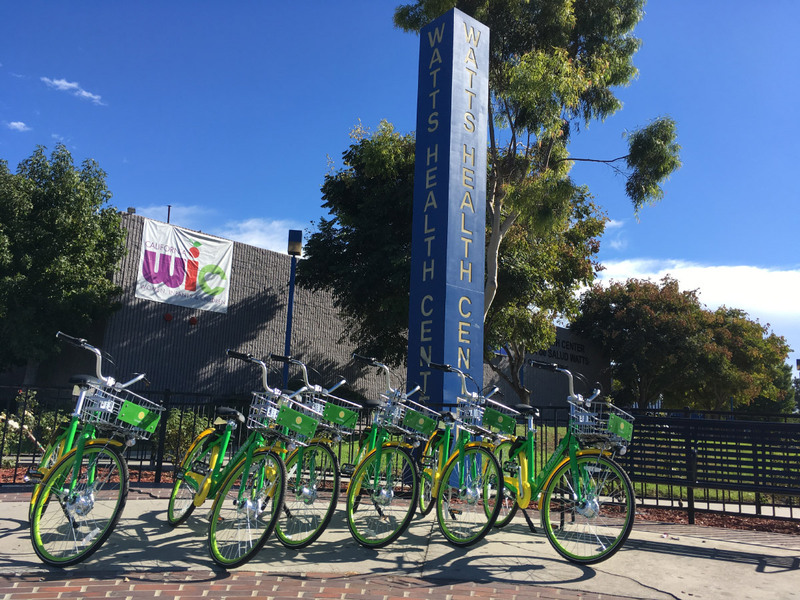 The nation's first bike share program began in Washington, D.C., in 2010 and dozens more programs have popped up in cities large and small across the country. 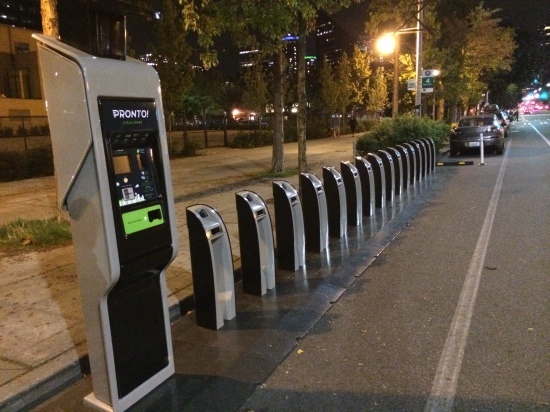 Seattle’s bike share program, Pronto, launches today! In the last few years, urban bike sharing has popped up all across the United States: in cities like Boston, New York, Washington D.C., Miami, San Francisco, and Chicago among others. Finally Seattle is getting it's first bike sharing program, Pronto Cycle Share, today. The program, operated by Portland-based Alta Bicycle Share, opens with 500 bikes distributed to 50 stations throughout downtown and central Seattle, with many near grocery stores. Stations will hold between 12 and 20 Arcade Cycles. There are short term passes available: 24 hour and 3-day passes ($8 and $16 respectively), with an annual membership starting at $85. Trips under 30 minutes are unlimited; after that there are additional usage fees. Riders can borrow free helmets, with pick up and drop off at every kiosk. 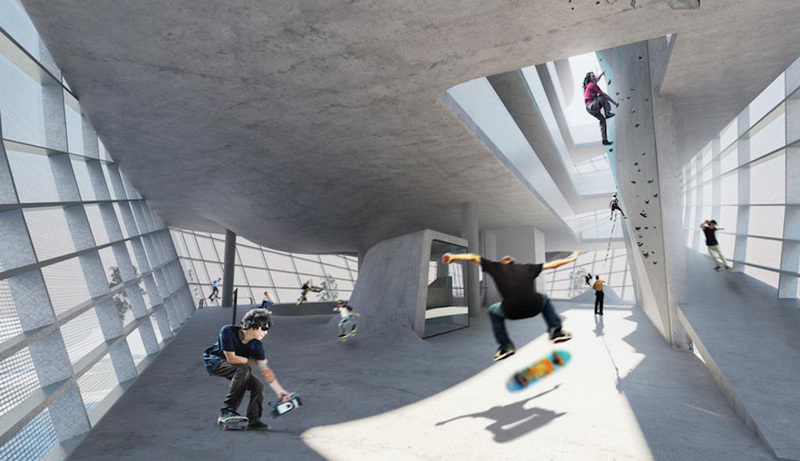 And there will be automated helmet vending machines, but they aren't ready yet. For now, it's an honor code system. And yes, the helmets will be sanitized. Alaska Airlines is the major brand sponsor, at $2.5 million for five years. So what's next? 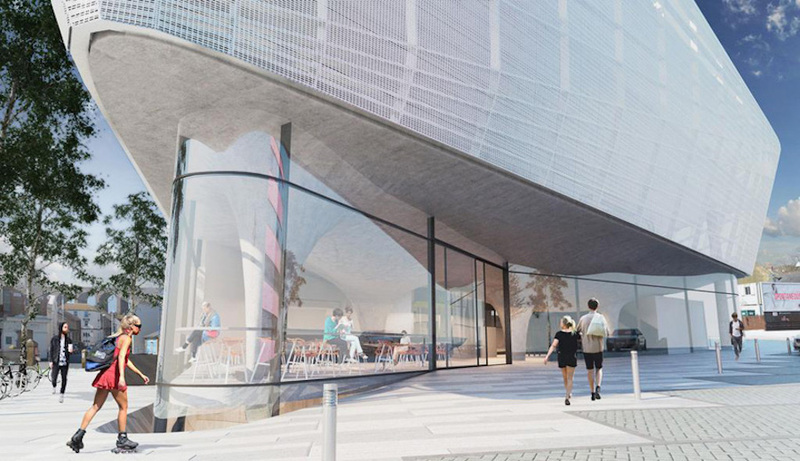 There are plans to expand to the Central District in 2015. More info about Seattle's new bike share program on Pronto's website.